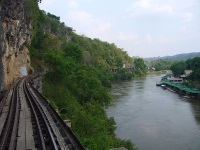 Eighty miles (130km) west of Bangkok, the town of Kanchanaburi has secured its position of infamy as the original site of the Bridge Over The River Kwai, where during World War II allied prisoners of war were used by the Japanese to build the Death Railway, killing thousands in the process. With its modern hotels and welcoming air, Kanchanaburi seems an unlikely setting, but the bridge is still in use and the graves of the Allied soldiers are testament to the town's unfortunate past. Worth a visit is the JEATH (Japan, England, Australia/America, Thailand and Holland) War Museum in Kanchanaburi, which recounts experiences in the Japanese POW camps during the War. The Sai Yok Yai Waterfall in the Sai Yok National Park is a place of idyllic beauty and makes a good excursion from Kanchanaburi; the falls are widely celebrated in Thai poetry and songs. The turquoise waters of Erawan Falls are also reachable from Kanchanaburi as an interesting day trip.